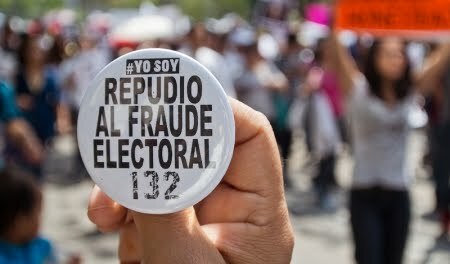 Members of #yosoy132 protest alleged election fraud in Mexico. Image from Center for International Policy. The court decision once again showed how divided Mexico is and how inured to election violations its population is. MEXICO CITY -- The 2012 Mexican presidential elections widened the political chasm between the political mainstream (aka. neoliberal) and the Mexican left. A poll taken after the July 1 presidential elections showed that 60% of Mexicans felt that the elections were clean, while 40% declared they were not clean. Rather than accepting what they considered to be election fraud, AMLO’s coalition of political parties, the Progressive Movement, filed a 624-page challenge to the election. While acknowledging that the apparent winner, Enrique Peña Nieto of the Revolutionary Institutional Party (PRI), received more votes than AMLO, the challengers declared that the elections should be annulled due to their having failed to meet the constitutional standard of fairness. The principle challenge to fairness was spending in excess of the legal limit. The $353 million of estimated spending included the cost of an “imperial” fleet of private airplanes and helicopters, massive campaign publicity, and the distribution of millions of items including home appliances, T-shirts, farm animals, and prepaid gift cards. The challengers also alleged that there was outright vote buying using cash, prepaid phone cards, and other items. Other charges leveled by the Progressive Movement included the use of pre-election polls, not to measure public opinion, but to create the image of an inevitable Peña Nieto victory. Mexico’s special election court rendered an unappealable decision affirming Peña Nieto’s victory. It ruled that excessive spending had only been suggested but not proved -- proof which would not be available until final campaign accounting was due in January. Similarly it rejected the many items, such as prepaid phone cards, used to show vote buying by declaring that the challengers only showed that the cards existed, not that they were used to buy votes. The other challenges were also dismissed. Flawed polling, the court ruled, was simply an exercise of free speech, not a cause for invalidating the election. The court decision once again showed how divided Mexico is and how inured to election violations its population is. A poll after the ruling showed that 55% of Mexicans thought the election court made the correct decision, while 71% felt that vote buying had occurred. The now officially victorious PRI candidate welcomed the decision and set about arranging the political transition. The PAN, the party of incumbent president Felipe Calderón, also accepted the decision but did suggest an obvious change to electoral procedure -- requiring parties to submit their records of campaign spending before the election court rules on the validity of an election. Not surprisingly, the ruling dismayed the progressive intelligentsia. Criticism centered on the court’s failure to use its investigatory power to determine the quantity and origin of the massive campaign spending obvious to everyday Mexicans. This, critics allege, would have likely uncovered money coming from illegal sources (such as drug traffickers), money channeled through illegal channels (by law money must be channeled through political parties), and money being spent in excess of the 336-million-peso limit. Critics noted requiring those challenging elections to document cash flow constitutes a virtual invitation to illegal spending. Political parties lack the power to subpoena bank records to document cash flow, while the court has full subpoena power. Similarly pundits noted the court set an almost impossibly high bar for proving vote buying since both material objects (as phone cards) and sworn testimony were deemed insufficient evidence to prove vote buying. 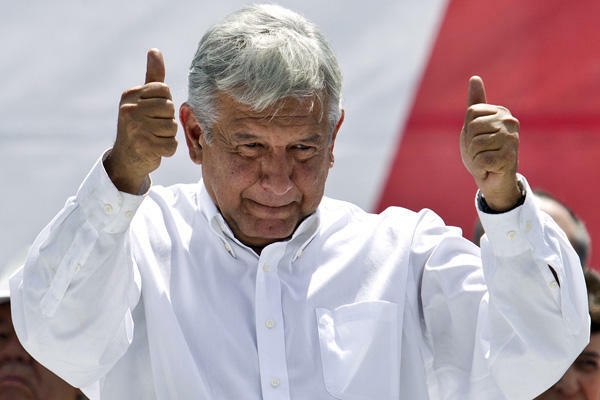 Andres Manuel Lopez Obrador, former presidential candidate of the Democratic Revolution Party (PRD), gives a thumbs up to his supporters at Mexico City's Zocalo Plaza, Sept. 9, 2012. Photo by Christian Palma / AP. Although members of the PRD, the main party of the coalition nominating AMLO, did not welcome the court ruling, the party not only failed to endorse protest demonstrations, but declared it would work within the system. PRD president Jesús Zambrano stated that since it was their duty to serve their citizens, state governors belonging to the PRD would recognize Peña Nieto as president and work with him. Similarly Miguel Barbosa, the PRD Senate leader, declared that the PRD congressional delegation would engage in dialogue with Peña Nieto. The PRD is pinning its hopes on creating a responsible image and thus building on the 15.9 million votes its candidate received in the 2012 presidential elections. This could position the party to challenge the PRI in the next presidential election in 2018. The best-known potential PRD candidate for 2018 is Marcelo Ebrard, current mayor of Mexico City. He is popular at the end of his six-year term and has already declared that when his term ends in December he will begin campaigning for the presidency. Another potential PRD candidate for 2018, Miguel Mancera, elected on July 1 to succeed Ebrard. Mancera, who outpolled the PRI mayoral candidate by 44%, faces the immense challenge of enhancing his image while administering the huge city characterized by the late writer John Ross as El Monstruo. While Mancera has to struggle with administering the monster, Ebrard, who will have no official position after December, must keep himself in voters’ minds. While the PRD vows to work within the system, its 2012 (and 2006) candidate Andres Manuel López Obrador took the opposite course. At a massive September 9 rally in Mexico City’s main plaza he declared, “I am not going to recognize Peña Nieto as president.” He also announced he was resigning from the PRD -- a party he had been a member of for 23 years and which he had served as president of. The meaning of AMLO’s leaving the PRD is still unclear. It will blur the image of the left. The PRD will attempt to serve as a responsible legislative force worthy of the presidency, while AMLO and Morena have specifically rejected such a course, saying he and his followers would not be errand boys for the Peña Nieto administration.